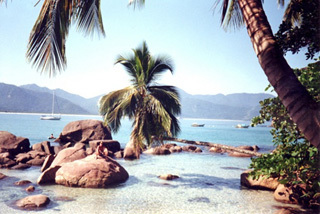 The first time I came to Ilha Grande was in 2003. It looked like something from a movie – A big, hilly island completely covered in rainforest. The hiking was amazing and since then I have been back several times. It’s just one of those places. In short: The island has been home to Indians, pirates, hospitals, prisons and now tourists. 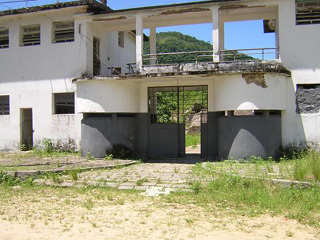 When the prison on Ilha Grande closed in 1994 it was basically only inhabiteted by fishermen and their families. Soon Brazilians discovered the pristine beauty and today tourists from all around the world come here to enjoy beaches, hiking, scuba diving and boat trips. There are some transports offered directly from the hostels and hotels in Rio, they normally include a trip down to Angra dos Reis and a boat to the island. They are in general good deals, it can save you trouble and time for almost the same cost as going on your own. These transfers are arranged by hostels on Ilha Grande so you might be obliged to stay at their particular place. If you want to double check the bus timetables (which I recommend) just go to Costa Verde, that is the company that operates these itineraries. If you want to have info about getting to and from the bus station in Rio click To and From the Bus Station. 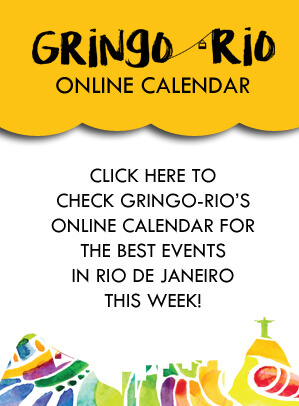 To find out where you can buy your bus ticket in advance – a good idea Fridays, holidays and during high season – just click Buses From Rio. There are other options available as well. Private operators that leave on other times and to remoter parts of the island, procure information about this on ilhagrande.com. It is very likely you will end up in the village Abrão, most of the island is a nature reserve and the goal is to accommodate most tourists here in order to preserve the nature. With some exceptions this seems to work pretty good. When I came here the first time it was pretty undeveloped but now you have more restaurants, some bars and internet cafés. Note that they still have no banks or ATM’s so bring your cash to the island. A charming fact is that they virtually have banned all cars from the island, the only exception is an ambulance, a police car and a trash truck. Finding a place to stay on the island is normally not a problem. 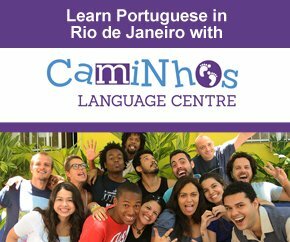 There is a multitude of pousadas and you also have some hostels and campings (you have to bring your own tent). The exception is holidays and the period late December until the end of February (when the Brazilians normally have their vacations). Coming to the island you will be swarmed by many eager people with offers, it can be worth to shop around a bit. There is also some options on other beaches. All the info about this and much more you can find on the official site for Ilha Grande I linked to above. One of the first hostels was Aquário Hostel, beauifully located on a small cape it is spectacular. A very tranquil option is the long running Holandês Hostel. If you are interested in something more than just chilling in a hammock there are plenty of options! Hiking One of my absolute favourites on the island is hiking. There are several options ranging from easy to hard. The one most people do is to the beach Lopez Mendez. It takes about 3 hours and is not so hard. On the way back many catch a boat. There are quite a few other slightly harder hikes; To Dois Rios, Aventureiro and Cachoeira da Feiticeira. 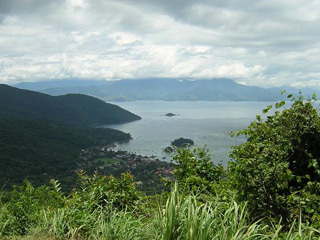 The hardest one is to Pico de Papagaiao that rewards you with a stunning 360 degree view of Ilha Grande, for this one I recommend a guide since there are no proper signs. CAUTION! Watch out for snakes, they are everywhere and some are really poisonous; for this reason do not hike alone. Don’t get lost, the island is big – after dark you can’t find your way anymore. Diving You have some wrecks and some nice marine life to check out. In Abrão you have many dive shops. If you want to know more about diving in Rio go to my Scuba Diving in Rio Page. Boat trips There are some really nice daytrips where you can practice good snorkling. Surfing On some of the beaches like Lopez Mendez you can surf. Check with the shops that rent out surf boards to see where there are waves and how to get there.